SSC CHSL Recruitment 2016 – Apply Online for LDC, DEO & PA/SA 5134 Vacancy through Combined Higher Secondary Level Examination 2016: SSC CHSL (10+2) 2016 Recruitment announced. Are you looking for SSC CHSL 2016 Notification? 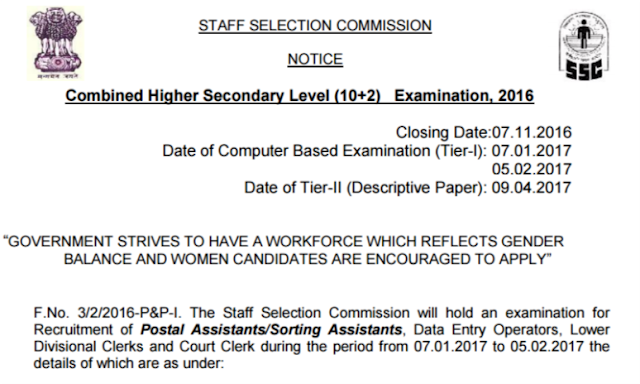 The Staff Selection Commission (SSC) has recently posted an employment notification for the recruitment of various Group C posts. Online applications are invited for SSC Combined Higher Secondary Level (CHSL) Examination 2016 for filling up Lower Divisional Clerks (LDC), Data Entry Operator (DEO), Sorting/ Postal Assistant (PA/ SA) categories of posts in various Ministries/ Departments/ Organisations. Educational Qualification: Candidates must have passed Intermediate/ 10+2/ Class 10th from any recognized Board of India. Candidates must type 35 WpM in English while 30 WpM in Hindi. Read eligibility criteria for post wise SSC CHSL (10+2) Educational Qualification details. Age Limitation: Candidates age should be between 18 years to 27 years for all other posts. Age relaxation is applicable as per the rules and it will be considered as on 01-08-2016. Mode of Selection: Eligible candidates will be selected for LDC, DEO & PA/ SA posts on the basis of their performance in Online exam, Descriptive exam followed by Typing skill test. Application fee should be paid through Offline and Online. In case of offline, candidates need to pay through “State Bank of India Challan” at any branch of State Bank of India. In case of online, candidates can pay application fee through internet using Online Banking, Debit Card/ Credit Card. How to Apply: All those candidates who wish to apply for SSC CHSL 2016 Recruitment for LDC, DEO & PA/ SA posts through Staff Selection Commission, they are required to apply through online mode on SSC’s official website at www.ssconline.nic.in on or before 7 November 2016. After filling online application candidates are required to take print out of the system generated online application form for further use. Apply Online for SSC CHSL 2016. Find and click on SSC Combine Graduate Level Examination link. Revisit the website and complete your application Part II. More Details: If you want more information, candidates are strongly advised to read official recruitment notification for more details about SSC CHSL Recruitment 2015 for Postal Assistant, LDC & DEO Posts regarding age limit, educational qualifications, last date, pay scale, how to apply and online application form.